Some days I just don't have the energy to come up with an intricate or complex art activity. Thankfully I have a quick and easy art activity that will keep the kids engaged and having fun. A bonus is that it is quick to clean up as well. First I set up a painting tray (a desk tray works well) that includes paint brushes, paint and paper towels (for messy fingers, and spills). 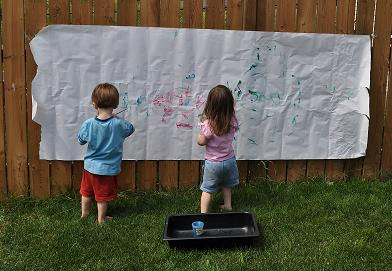 Then I tape up a large sheet of paper onto a fence or along the side of the school and then I give the kids some washable tempera paint and Voila! Instant Art. This activity is always a hit. The kids will switch and trade colors and even do a little color mixing. Not only is it quick and easy but it is also great for building fine motor and shoulder muscles. But the best part of this activity is the clean up. Once the painting is dry you can roll it up and clean up is done, any little paint drips will disappear on the next rainy day. The perfect time for this activity is when the warm weather rolls in during the spring and summertime, the kids are usually restless from being indoors all winter and need some more time outside. Taking the art outdoors creates that much of a novelty that they engage with it right away! I get commissions on purchases made through links on this post. For more information please see my disclosure policy.